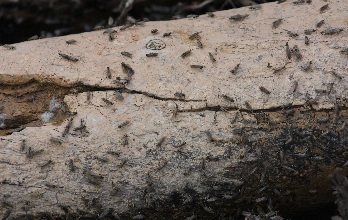 Caddis fly larvae make up a large percentage of the diet of many species of trout, especially in rivers and streams. Caddis fly larvae are sometimes called 'rock rollers' because they roll around on the bottom of streams, secreting a sticky substance that causes tiny rocks, gravel and sticks to stick to them. This gives them a somewhat hard shell that servers to protect them against some predators (but not against trout). This gives them a circular, tube-like appearance. Turn over any decent sized stone in most trout streams, and you're likely to find many of these little tasty trout morsels attached to the underside of the rock (along with other insects and small animals such as leeches and stone fly nymphs). Collect several rock rollers from the stream you wish to fish (remember to always check local regulations to be sure that bait is allowed on the water you plan to fish). Use a small hook, preferably sizes 10, 12, 14 or even 16, and hook 1 or 2 caddis larvae, including the shell, onto the hook. Cast them upstream and let them drift and roll through the current in the same manner you'd fish a worm. You want it to drift as close to the bottom as possible -- even bouncing on the bottom if you can -- without getting snagged. A small split shot sinker, about 18 inches above the hook, may be necessary to keep it down, especially in faster flowing waters. This is a trout's natural food, and they will hit hard and often swallow the bait, since it is real food. Try to cast delicately, since they can easily fall apart, and won't last long on your hook. Remember to let it drift through holes, into eddies, at the tail end of riffles, etc. Watch closely, and if your line stops, hesitate for a split second, and then set the hook with a short jerk. You probably shouldn't plan on catching them in advance, since they won't keep well stored at home. It's best to just get to your fishing destination and collect them there. That way they'll be fresh, will 'match the hatch' exactly to what is in the stream, and you won't have to pay $3 a dozen for worms at the store either.